Bilou hit the stands a few years ago now, and always intrigued me with their shower foams, being one of the first brands to offer them. The range has now expanded, with a 2-in-1 moisturising, deodorising body spray*, and a cream foam body lotion* being added. 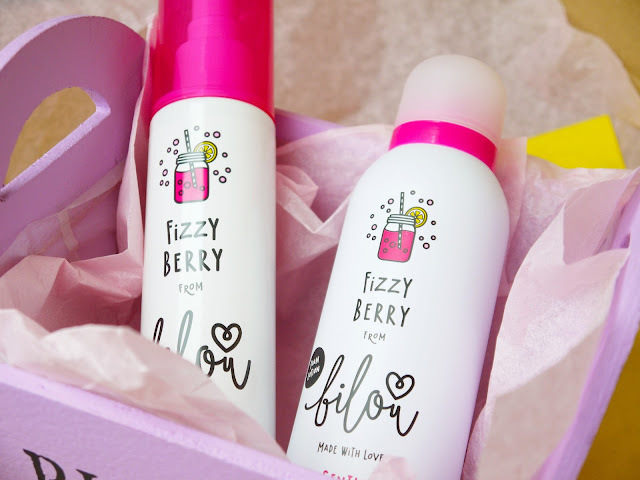 As well as their unusual products, I've always been curious about their gourmand fragrances, which include Yummy Doughnut, Pink Melon, and the one I chose to try: Fizzy Berry. The stand out element for both products is the scent, which is truly delicious. On first spritz it smells so fruity it's almost sour, like a Haribo Tangfastic. I can definitely smell juicy raspberry and lemons, and while it is lovely, I was a little concerned that the strong scent would stay on me. Happily, it dried down to a softer, sweeter scent, which reminds me of a fresh, delicious doughnut. The 2-in-1 body spray was something I felt a little dubious of. Deodorants usually leave a dry, chalky feel on the skin whereas moisturisers are greasy, so I wouldn't ordinarily moisturise my underarms or deodorise my body. However, in the name of testing, I spritzed myself up and climbed a hill as fast as I could. Oh, the things I do for this blog. I was pleasantly surprised at how it performed. A good sniff of the pits confirmed that I still smelled bakery fresh, thank goodness, and actually I hadn't detected any greasy feeling as I wore the spray. It did lie a little on the dry side like traditional deodorants, so I won't spray this on my body or clothes, but I'm really happy with how it kept me fresh and comfortable. If you do want a scent for your whole body, this is where I would recommend the cream foam. It's cool and soothing to apply and sinks in really fast, leaving behind that super sweet scent that really does waft. I didn't find it overpowering, but you certainly wouldn't need a perfume over this. Although it contains sweet almond and avocado oils, the moisturiser isn't very rich and I wouldn't recommend it to anyone looking for deep hydration and nourishment, but it's ideal to use quickly before getting dressed in the morning. Both products are fun and functional, but weren't necessarily the best in their categories. I was impressed that the spray had no alcohol and the cream foam used real plant oils, but the scent is their real selling point in my eyes. I'm okay with that, as it really is excellent. I love that Bilou have perfected both the sharp fruity scent and a warm doughnut fragrance, yet neither side is cloying or childish, and I'd be happy to buy the products just to enjoy them. *items were sent for review. This does not affect my opinion or honesty.